The stela dates from the Ur III period, at the end of the third millennium BC, and shows the king, Ur-Namma, receiving the ‘rod and coil’, a symbol of power, from the god of his dynasty, while he pours some water on a tree. Incidentally, despite my reproduction, the stela isn’t actually made of a grey stone, but a nice beige one. I’ve seen the black and white copy above so many times that I bought grey fondant without even thinking. The cake itself is more proof of concept than a truly excellent bake. It’s a bit rough and ready, and it certainly lacks detailing. All of this is a great shame, because I really wanted to say that it was stellar. 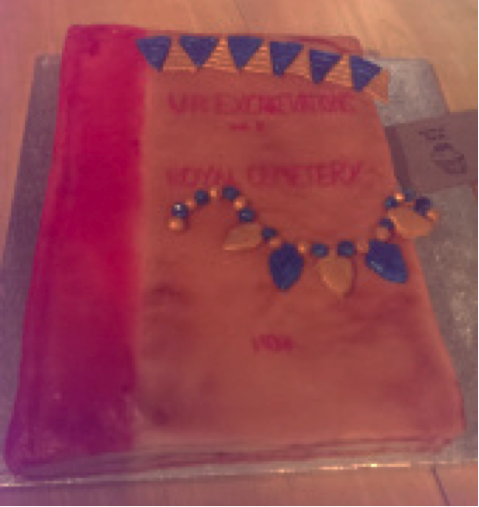 My problem was this: how to properly capture Mesopotamian reliefs in cake. Bas reliefs on cakes are normally fondant, pressed into shape in a mold and then laid on top of the cake. There were a few problems with this technique: first, while I am definitely in the market for ancient Mesopotamian molds, I didn’t have one to hand this afternoon. Second, I really dislike the practice of building up huge deposits of fondant on a cake. It’s not because I don’t like eating mounds of pure sugar (its normally best to buy double quantities of fondant when I’m decorating, because I do snack as I go), it just feels like cheating, because at its heart then fondant is just edible modelling clay. 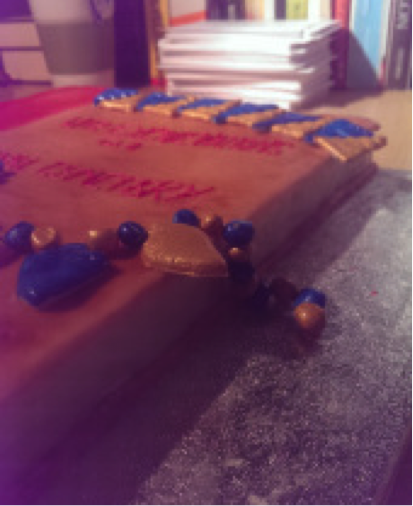 So this is what I went for instead: a sheet of cake, with figures cut from a second sheet and laid on top. Then I built up the 3D features, like the arms and clothing folds with more cake and icing, before laying fondant over it. It sort of works. What a relief (I’m hilarious). 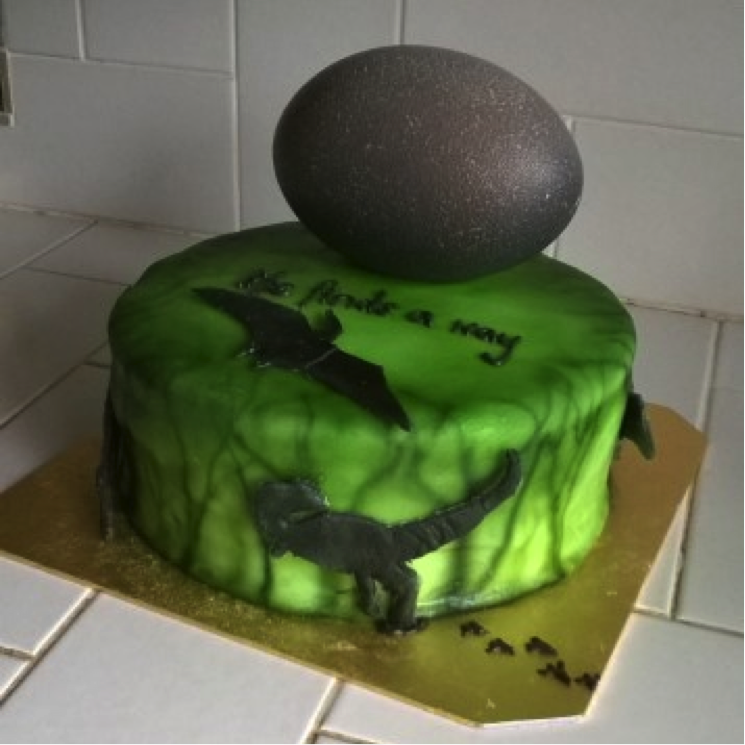 The other bonus about this cake is that it actually relates to an article I’m writing, which at least references the rod and coil. This is pleasant for me, because my current research focuses on ancient Mesopotamian measuring systems and is heavy in statistics, so it was this or the the Cosine Quantogram analysis. I hear you saying that I couldn’t possibly make that into a cake, and you’d be right. I had to use biscuit to make a version of the Cosine Quantogram analysis results from my last paper. I’ve found the appeal to be limited. A timeline of the invention of writing. Which is made of cake and chocolate. And strawberry laces. I have spent longer trying to figure out a good pun for this post than I spent baking the cakes, and I’ve finally just given up. I nearly made the entire thing out of Scottish tablet so I could work one in. It would have been the right colour and a pretty good consistency, but then I don’t like Scottish tablet, and what’s the point of making a timeline of the invention of writing in cake form if you won’t enjoy eating it afterwards? So instead this is all chocolate cake, coffee icing, coffee fondant, chocolate and strawberry laces. I can now inform my readership that strawberry laces do not go with any of those other foods. This blog truly is about learning. All dates are, naturally, BC. So we start off with chocolate tokens, in geometric shapes (those splodges of chocolate definitely count as circles). 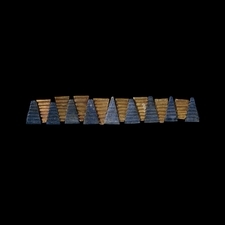 Non- chocolate versions are found from 8000BC-3000BC at various archaeological sites, and were probably counters to keep track of goods (so one cone represents one jar of grain, and one splodge represents one sheep). And then, in 3500 BC, tokens started being stored in round, hollow envelopes. 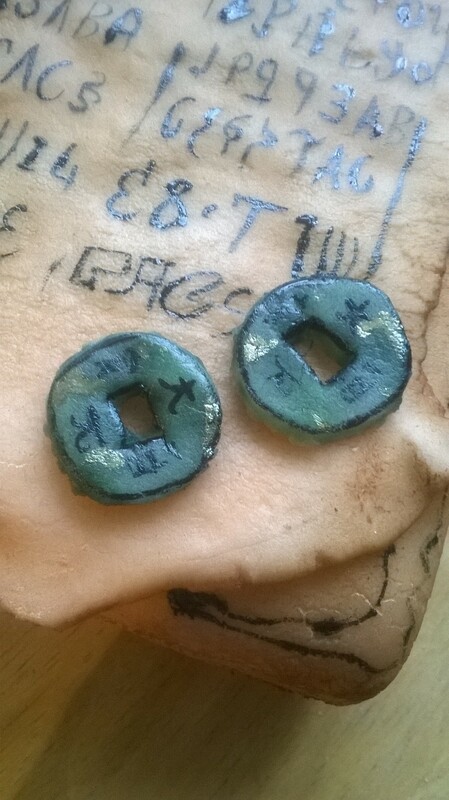 In some cases, impressions of the tokens that were inside were made on the outside, so you didn’t have to crack open the envelope to see what was inside. Gradually, flattened clay tablets with the signs impressed on them replaced the envelopes. By 3100BC, there were added pictograms, which could indicate the goods, names of individuals, and perhaps even the intended use of the goods. So in the larger, more complex tablet, the box on the top left has a quantity, a picture of grain, and a picture of ration bowls. So maybe this suggests that this grain was intended as rations. Or maybe not. Honestly, every time I read about these archaic writing systems, I become more convinced that they’re just looking at squiggly pictures and making it up. This is what all this looks like when it’s not made of cake, by the way. It’s terribly impressive, but here’s what you can do with mine that you can’t do with ancient artefacts. They may have invented writing, but this is my lunch. I think we all know who’s winning here. I also have a new favourite blog. It’s The CREWS project blog, and their ancient artefact baking, knitting and pun game is on point. I’d like to sincerely thank them for giving me something to read while I avoid cleaning the kitchen. Next week: how these archaic systems developed into cuneiform. Woo. One of these days, I’d like to do a carved chocolate replica of the Sutton Hoo helmet. But for now, I’m starting small. 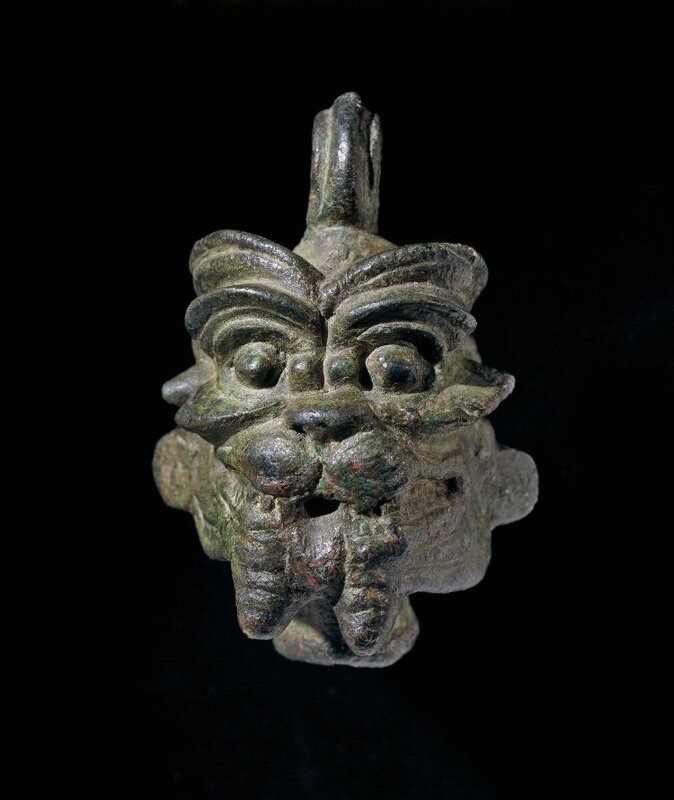 So here’s the purse-lid from the same burial. 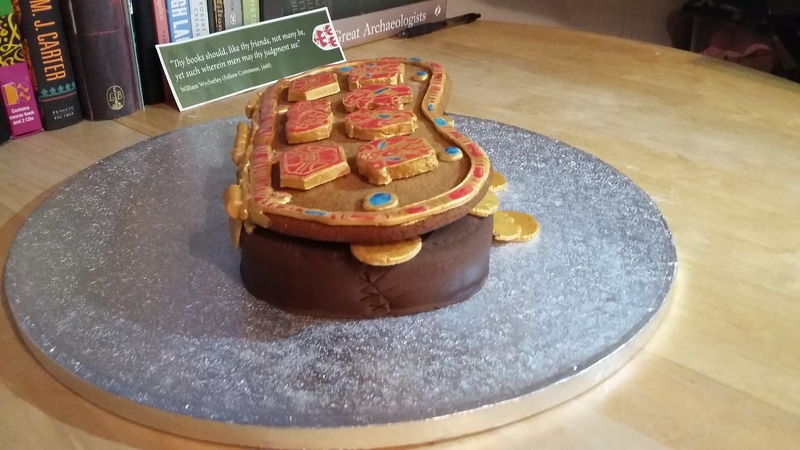 Complete with imagined replica purse, because I wanted an actual cake instead of just a biscuit. As with all these cakes, this represents literally hours of my life. Ok, perhaps one hour. Maybe forty five minutes. It’s still far too long to be spent painting tiny lumps of fondant. The base of mine is chocolate cake, coated in chocolate fondant, and the lid itself is gingerbread, decorated with hand-painted fondant and royal icing. The somewhat lazy coins are hand-painted fondant (by hand-painted I mainly mean that I sort of half-heartedly splashed them with some gold paint because by then my back, hand and eyes were hurting, and Lewis was on. Even I have my limits). One of my favourite parts of the purse-lid is the Master of the Animals motif. It turns up in so many places (Mesopotamia got there first, obviously) that it always feels like an old friend when you see it somewhere new. 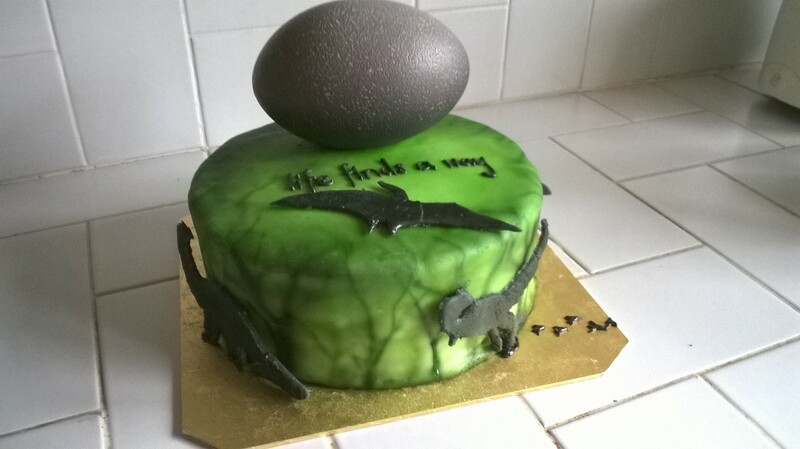 I’m sure that making a bastardised version from smudgy paint and fondant is the perfect way to honour it. Did you know, by the way, that the king found buried in the ship burial at Sutton Hoo was king of the ‘Wuffing Dynasty’? I know it means ‘the wolf people dynasty’, and yet it still sounds like something out of Dr. Seuss. 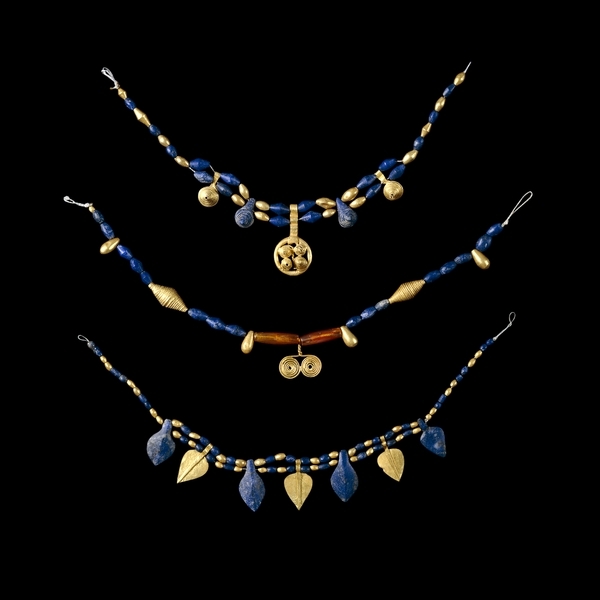 According to the British Museum the vast hoard of riches is a ‘dramatic expression of the aspirations of Anglo Saxon royalty’. I wonder if their main aspiration was people overlooking their ridiculous name. Next week – I miss Mesopotamia. There everyone had sensible names. Like Silli-Sin. And Suppiluliuma. In September, my parents will be in China, where they’ll visit, among other places, one of the cities that could be thought of as a starting point of the silk road. 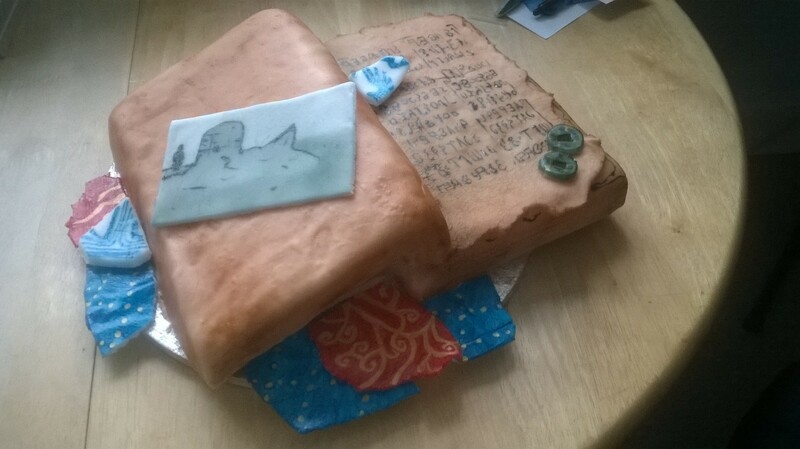 In order to work through some of my burning jealousy, I made a silk road themed cake. I also made a fondant copy of one of Aurel Stein’s photographs, showing the ruined stupa of Miran. The coins are ones found by Stein (currently in the British Museum). And then there’s scraps of silk and a piece of porcelain (both also Stein’s, currently in the V and A). I…I think I sort of hoped that if I made enough junk for this cake, I could go to China (comments about how junks could get me to China will be met with heavy sighs). Obviously this is all fondant (I really must make some more cakes and edibles that aren’t fondant at some point). The structure of the cake was a little difficult to work out. 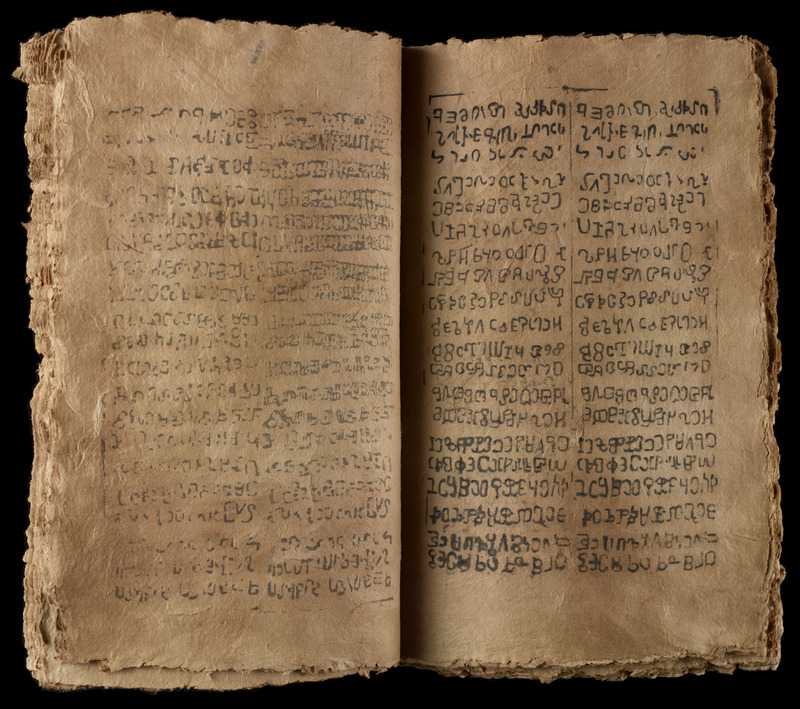 The manuscript is clearly just a stack of papers with two fairly solid rods passed through them. That means when it’s opened, it doesn’t fall open like a book. Instead, the bottom pages stay in a stack, and the top pages bend around and over (hours spent stacking papers, and trying to see how they open, are hours well spent). The bottom cake, therefore, is a single rectangle. After I’d fondant-ed it, I stacked a thin section of cake along it’s left hand edge, crumb coated that and pushed supports down through it. Then I took a crumb coated, shaped, second rectangle of cake, placed it on the supports, so it sloped away at an angle, and butter creamed the join so it had a nice curve and looked like it was all one piece. Then I fondant-ed that. That was my Saturday night. 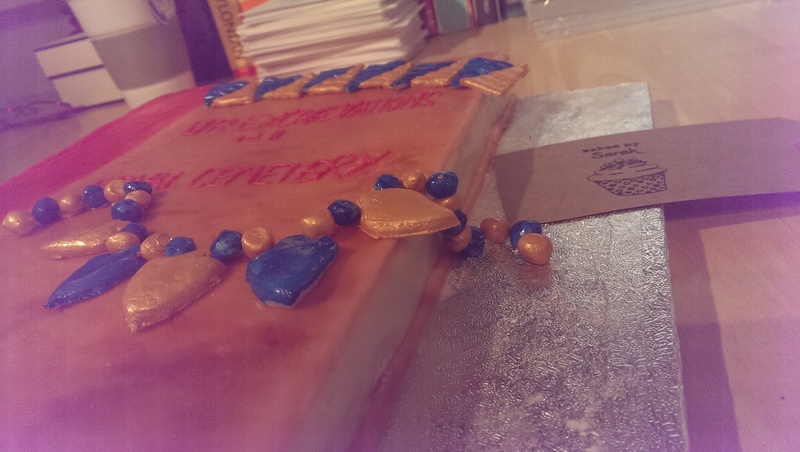 The rest is just fondant shapes, and of course virtually everything has been painted or airbrushed in some way. Here it is with those scraps of silk i promised above. I think this might have been taking it a little too far. 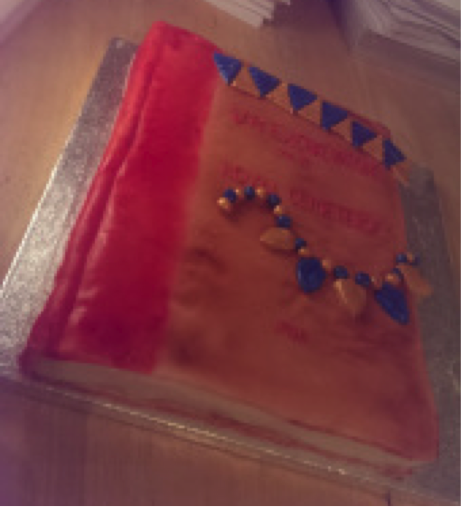 The absolute most important take away from this cake, incidentally, is that the International Dunhuang Project website is just amazing. It is an absolutely brilliant place to waste time. Go there. Go there now. 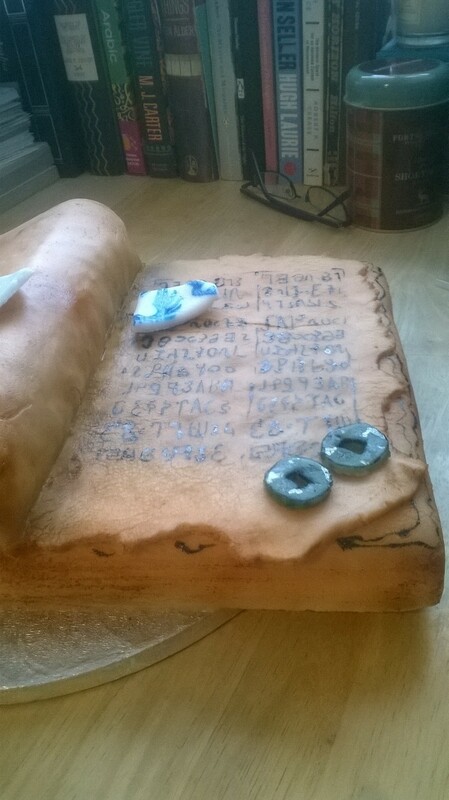 So, I appreciate that this cake has nothing whatsoever to do with ancient artefacts. I also appreciate that there are undoubtedly gross inaccuracies in my rendering of the dinosaurs, not least the question of what a pterodactyl is doing in the forest (the nagging doubt in my mind as to whether a pterodactyl is actually a dinosaur has been confirmed by a quick google search, so make that ‘gross inaccuracies in my rendering of the dinosaurs and pterosaurs’. I’d go back and change it, but it just seems like cheating to act as if I knew that in the first place). The basic cake for this is a vanilla sponge, because, contrary to appearances, I am actually very busy at the moment, and trying to think of the cake design and the cake as well proved too much. I covered it with a nice, light green fondant, and then I spent several hours playing with my airbrush to make something that vaguely approximated a forest. 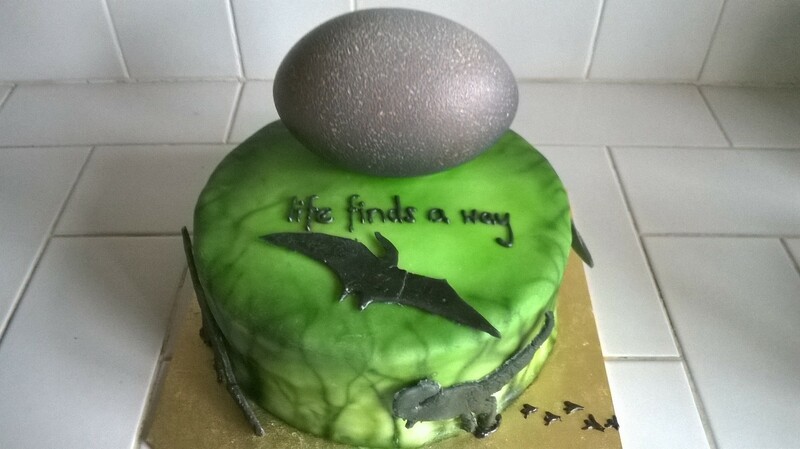 The dinosaur (and indeed, pterosaur) silhouettes are cut, painted fondant. 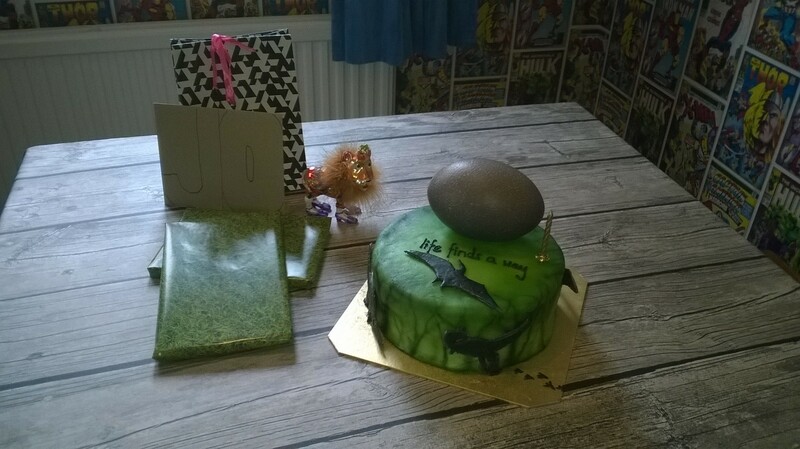 And the egg is an ostrich egg, filled with tickets for Jurassic World. 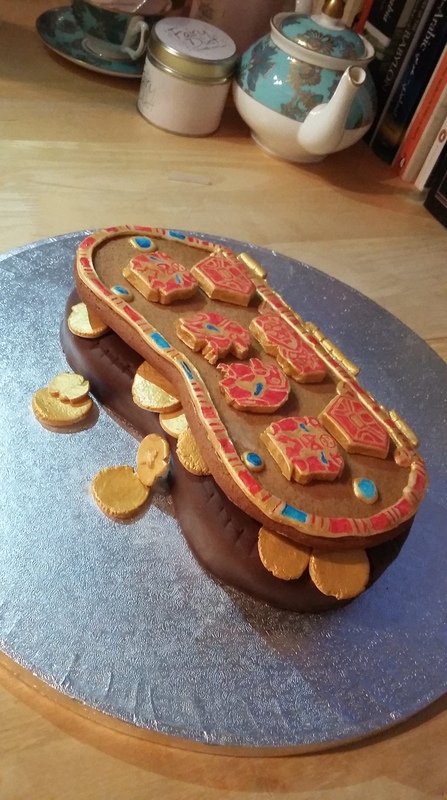 Because this is a birthday cake. Happy birthday, mum. Life finds a way. Don’t worry, we also got her that Clint Eastwood film where he teams up with an orang-utan. I went for a book cake because I was just given an airbrush for spraying edible paint: I was desperate to give it a try, but also knew that spraying evenly might well be harder than it looked. So the book is an old book, and any patchiness is caused by my desire to create a battered, used effect, and should certainly not be put down to the fact that I am so bad at airbrush spraying I held the airbrush the wrong way round and sprayed the cupboard behind me. This cake is made from the commonest vanilla sponge (2 eggs, 100g of flour, butter and caster sugar, 1 tsp baking powder and a splash of vanilla). 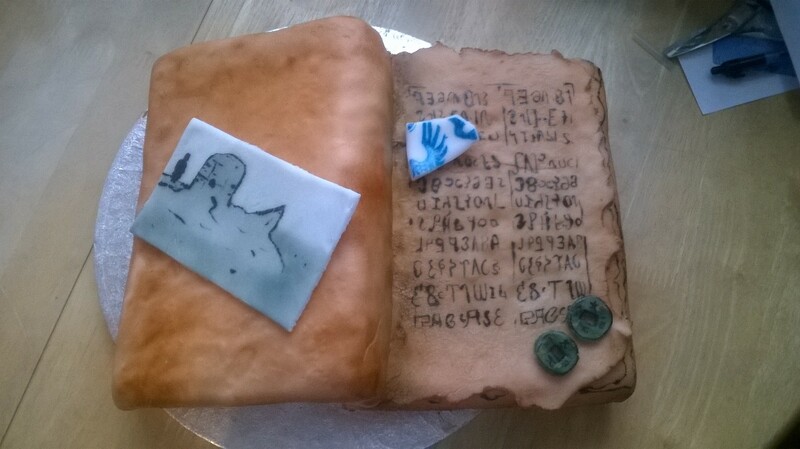 I crumb coated it, covered it in fondant (while wishing I’d picked a slightly smaller book), and then airbrushed in the colours. The beads are little fondant shapes, left to dry and then painted. Simple. 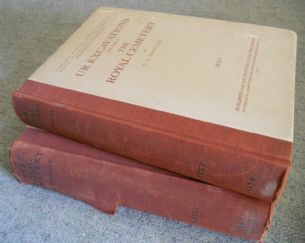 Oh, and I found a picture of Ur Excavations vol. II online. I mean…they’re vaguely similar. At least I didn’t imagine the red spine. Now, making these is very simple. It only took me a couple of hours, and those people who don’t accidentally loose their piping bag, forget where the butter is and burn themselves on the oven, should find this even quicker. Firstly, make the biscuits. I’ve already given the recipe for these under “Glazed brick mushhushu biscuits” (substitute 25g of flour for 25g of cocoa powder to make them chocolate). 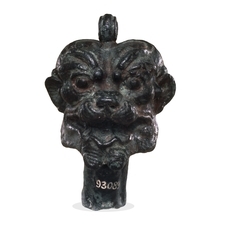 While the dough is resting in the fridge, make templates of the Pazuzu amulets. Roll out the dough, cut out the template shapes, put them on the baking tray and then put the baking tray in the fridge for about half an hour. Then, put them in the oven. While they’re in the fridge/oven, make up two bowls of chocolate royal icing – one stiff and dark, the other liquid and lighter in colour. 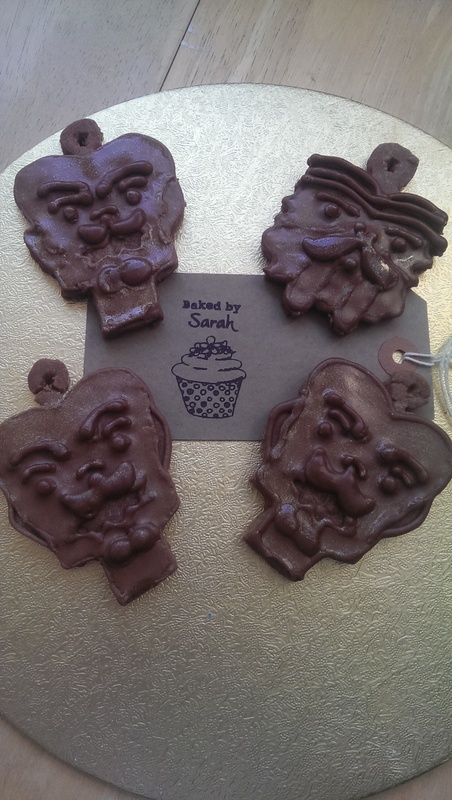 Fill a piping bag with the stiffer icing, and use it to outline the biscuits, and draw in any of the features that look “lower” on the amulets (I did the mouth and ears for the one on the left, and the strange beard thing for the one of the right). Leave that to set, then “flood” the biscuits with the liquid icing. Once that’s set, draw in the stronger facial features with the stiff, darker icing in the piping bag – the eyebrows, the eyes, the moustaches. And you’re done. All that’s left is to cover them in Sainsbury’s metallic lustre, wonder what possessed you to think Sainsbury’s metallic lustre would be any good, and only show one photograph of them covered in said lustre on your blog. My early birthday present from my boyfriend (early because I am an impatient child, and he is too indulgent of this) is a set of stamps and tags for baked goods. I think they match the Pazuzu amulets perfectly.